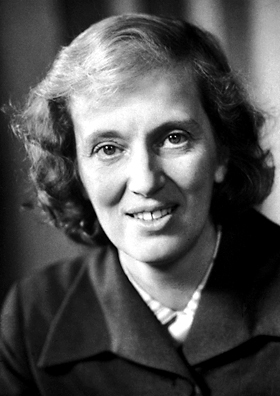 On August 14, 1969, Dr. Dorothy Hodgkin used a science she had pioneered — X-ray crystallography — to decipher the three-dimensional structure of insulin, a protein that plays an important role in diabetes. This discovery helped scientists understand how to treat the symptoms of diabetes. What is remarkable is that this momentious discovery was made after Dorothy had been awarded the Nobel Prize for Chemistry in 1964, only the third woman to ever win this Nobel Prize (the other two were Marie Curie in 1911 and her daughter, Irene Joliet-Curie, in 1935). Dorothy was awarded the Nobel Prize for her work on the structure of a different important molecule, vitamin B-12. For most people, a Nobel prize would be enough. Not Dorothy! She also was the second woman to receive the Order of Merit (after Florence Nightingale), the first woman to receive the Copley Medal, a Fellow of the Royal Society, a recipient of the Lenin Peace Prize, the Longstaff Medal, the Mikhail Lomonosov Gold Medal, the Dimitrov Prize 1984. Oh, and she’s on a stamp, too. Learn more about Dorothy HERE. This entry was posted in The Quotable Nerdy Chick and tagged brainy women quotes, chemistry, dorothy hodgkin, famous quotes, famous women quotes, nerdy chick, nerdy chicks, nobel prize, Nobel Prize females, Quotable Nerdy Chick, quote, quotes, quotes from smart women, quotes from women, scientist, Smart woman quotes, Women Nobel Prize Winners.